This was a rainy day wedding at beautiful Doyle's Vineyard and Rebecca and Matt couldn't have handled it better! They were so laid back and understanding that their wedding day would be one of those where it would start warm, have rain and drizzle move in, followed by a brief period of winds and then a temperature plummet. The couple designed a laid back and rustic feel to their day, including bright fall-colored flowers and table settings, which added the perfect touch of color to the grey and dreary day. Despite a delayed start to the ceremony to let the rain pass, drizzle throughout the ceremony, wet benches for the guests to sit on and a general gloomy feel to this Sunday wedding, the guests were exceptionally excited for this bride and groom. After we finished the formal images with family, we let the family retreat to the reception tent and I spent some time with the newlyweds doing their couples images. 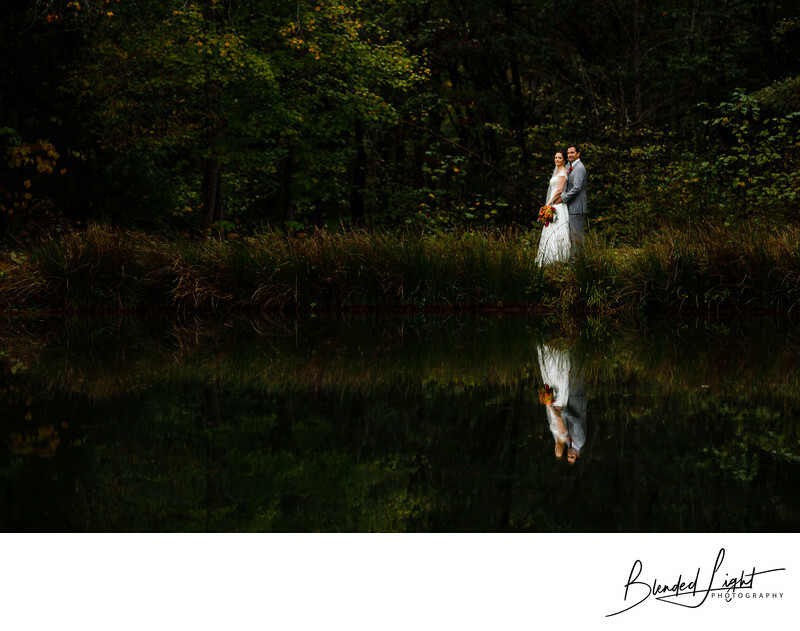 We did images with the dark looming clouds for a dramatic look, did some in front of the chapel as requested by the couple, but I was trying to figure out how to incorporate this fantastic pond into a memorable image. As the couple took a second to share a drink with their wedding coordinator, it hit me what I needed to - recreate for them an image I made during the bride's walk down the aisle with her dad with a slight twist. The maid of honor was there helping me, so I set up a single studio flash with a large octagonal soft box, metered the light, got the couple in position and jogged to the other side of the pond. Yes, I literally jogged to the other side. I took a second to find the exact spot I was wanting to frame the couple in. I ended up laying in the wet grass, stomach down aiming the camera across the pond. After some minor adjustments to couple's posing, my camera settings and light power, I worked to steady myself as the rain began to fall again. Working quickly, my 3rd and 4th images were spot on and I was able to get the couple under the safety of cover before the bottom literally fell out. Despite the overall gloomy and mostly sunless skies, the background for this image was relatively bright in comparison to the couple. For this image, that's not the feel I wanted. So the processing was 2 part. First, I ever-so-slightly brightened the couple and their reflection and added a touch of sharpening. This made them stand out well against the background and in the darker waters. To add more emphasis to them, I "burned" the brighter parts of the image, eliciting the bright yellows and greens by replacing them with darker versions of the same color. Simple editing techniques like these can make the difference between a OK image a great image that clients love. Doyles Vineyard in Durham is a fantastic venue for your small to medium size wedding and I would love to be able to chat with you if you plan to wed there. Location: Doyles Vineyard, 8913 NC Highway 751, Durham, NC 27713. 1/200; f/3.2; ISO 100; 140.0 mm.